Chinese history is over 5,000 years old. This page is specially created for Overseas Chinese and anyone interested in understanding the roots. Dates are also provided for major Chinese festivals (see below). Keeping brooms out of sight. To prevent what one wishes for in the new year being swept away. Chinese family gather together to have their `reunion' dinner in the evening. All family members (including daughter-in-law) have a feast together. General Qin Shu Bao and General Yuchi Jingde of the early Tang Dynasty. 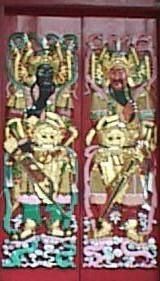 Both Generals hold golden axes in their hands and held a sword, bow and arrows on their waist. Some people instead prefer to write their names on the doors instead of hanging their pictures. Make offerings (food) and offer incense to ancestors. Traditionally Fire crackers were let off to drive away evil and illnesses. Chinese couples and their children would visit relatives especially their parents and elders and present them with two mandarin oranges and a `Red packet' or Ang Pow. The daughter-in-law returns to her home to renew ties with her parents, brothers and sisters. Faithful dog day. This day, some Chinese are superstitious and will stay at home to relax and do not visit relatives. Only after 12.00pm, burning pictures of deities, gods and their bodyguards in the hope that they receive the invitation to visit earth. The day to bring out rubbish to throw away. The day to remove offerings to the deities and gods. For businesses, offerings to the gods and hang a red cloth over the shop front. Day of the Heavenly stars or God of Stars. At night, place an altar outdoors and make offering to the stars. Birthday of the Jade Emperor. The Jade Emperor was considered a supreme deity who had created Heaven and Earth. He lived in the Jade Capital Mount and thus was known as the Jade Emperor. He is also known as Ti Kong or Heaven God. On this day, some Chinese offer incense and pay their respects to him. Last day of Chinese New Year. This is the last day of Chinese New Year. In Northern China, originated from the reign of Emperor Wu Di of the Han Dynasty; a pair of lanterns are hung outside the home. Fire crackers were allow let off. This practice started during the Zhou Dynasty. On this day, food is prepared without using a stove (fire). 2nd Month, 16th Day. Starts from Yin time of between 3 to 5 am. This practice started during the Han Dynasty as this is spring where it is clear weather. This became an official festival from the Tang Dynasty onwards. This is the day of remembering the dead. Family members go to the cemetery sometimes for three consecutive days to pay respects to the dead. Weeds are removed from the ancestor's tomb and swept. Paper gold or hell notes etc.. are burned and offered to the dead. Food is offered especially whole roasted pig and colored cakes. The 5th Day of the 5th month is considered the most dangerous day. 5th month is the dragon month where one has to take extra precaution against sickness and diseases. The purpose of the Dragon Boat Festival is to ward off evil and to commemorate the start of summer. Since ancient times, the Chinese belief that during the 7th month, the gates of hell is opened and hungry ghosts are allowed to wander on earth. This is considered a dangerous month to go out. Chinese avoid getting married, moving house, buying a car and organizing any other events during the 7th month. For 2000, this is from 31st July to 28 August 2000. In ancient China which was an agricultural society, this day is the day to celebrate the brightest moon and praying to the Goddess of the Moon. Chong Yang Festival or Climbing the heights. This is another day set aside to visit the grave of an ancestor. Alternatively, families gather at high points e.g. hill sites for picnics. The requirements are to bring along chrysanthemum drink and a cake. The hope that when one eats the cake, it will mean advancement for him/her. This day falls on first day of winter solstice. This date is of similar significance to the Chinese New Year. Family member gather to have a feast together during this day. This is the to celebrate the end of winter solstice. In Chinese astrology, this is the start of a new year especially for farmers. Similar to Thanksgiving. This is a day of festivities and some businesses would close for the day and incense offered to the gods. The atmosphere is like that of a New Year.